What you’re looking at is a futuristic concept where technology weaves itself irreversibly into our flora and fauna. 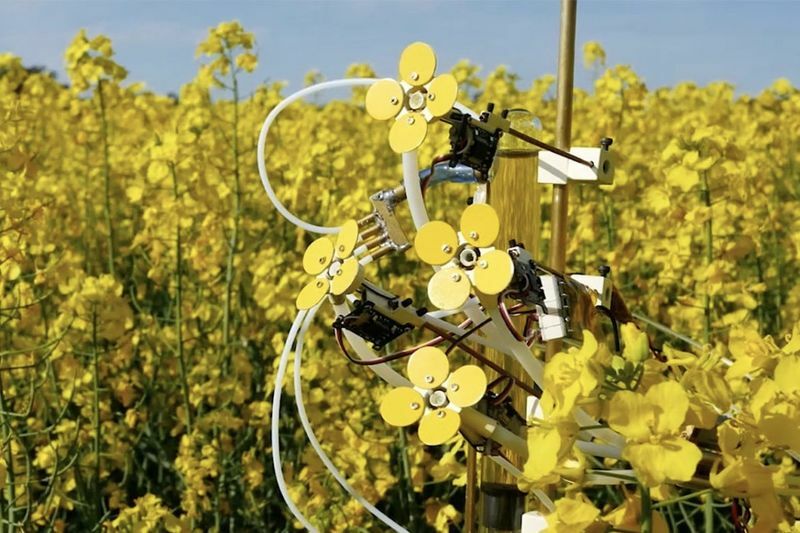 Known as the Synthetic Pollenizer that allows plants to artificially reproduce by attaching pollen to the bee’s legs. The plant, in a lot of ways, works exactly like a normal flower, but with a bunch of gears, servo motors, and extruders. The Pollenizer collects pollen from pollen traps (used for medical purposes) and extrudes the pollen onto stamens that move in and out of the flower, coating themselves with the powdery yellow material. In the centre of the flower lies the nectar pit, which is filled with artificial nectar that the designer, Michael Candy, fashioned from sugar and water. The bees rest on the artificial flower to drink the nectar and are then coated – every time – with the sweet pollen. The bees will then carry that pollen to real flowers, facilitating the reproduction process. There’s even a camera that live-streams the entire beautiful process of the bee flitting to the flower, drinking the nectar, and buzzing off with pollen attached to it. Creating a convincing artificial pollinizer is difficult; bees are intelligent and are excellent navigators with highly acute sensors. The flowers are made from many different materials and processes, from 3D printed parts and glass to hand-machined aluminium and brass, with initial prototypes being made from paper. Michael Candy experimented with different breeds of flowers, from orchids to daisies. The flower shown here is the canola (or rapeseed) flower. You can have a look at the video below to see more about the Synthetic Pollenizer. SYNTHETIC POLLENIZER from michael candy on Vimeo. Video: 7 Sci-fi Gadgets That Really Exist!